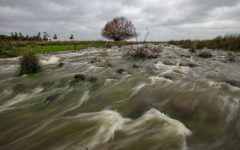 Heavy waters stream in the Golan Heights on January 26, 2018. IDF helicopters and rescue teams pulled eight people, who were trapped in a swollen river in the north, to safety as the country was hit by a winter storm. The group had entered the Nahal Hizalon in off-road vehicles. Three of those rescued were later taken to hospitals in Haifa and Naharia and treated for hypothermia. Elsewhere, heavy snow fell at Mount Hermon in the Golan Heights, as well as in the northern city of Safed. The Hermon ski resort remained closed due to the heavy snowfall, while roads in the area were closed intermittently due to the weather. Streets in the northern cities of Hadera and Netanya flooded.